Roy stopped by the teahouse earlier this week with five popular black teas that are now back in stock. We'll have more details in the next newsletter, but here's a rundown for black tea lovers. The new releases are now available in our online store and teahouses. The most striking tea was the Keemun Hao Ya Gift Tea, which has a delicious fruitiness and a well-balanced hint of smoke. This tea is complex and subtle, with keemun's classic bright red liquor. Roy said it's a good tea to drink with chocolate mousse! Imperial Keemun Mao Feng has an outrageously fruity aroma that yields to rich smokiness when moistened. But once it's infused, the flavors fall into balance, with the fruit coming forward and the smoke providing structure. There's a rich red liquor that tastes substantial and beefy, full of robust flavor. Roy noted that the smokiness would make this tea an outstanding choice with food; he was picturing grilled lamb. We also sampled Hong Mei Mao Feng, an exceptional black tea from Zhejiang, the province best known as the home of dragonwell. This tea has a delicious "plummy" fruit character (hong mei means "red plum") that will remind you of a fine port wine, and a chewy, almost meaty texture. It's one of Roy's favorites in the group. Moving west geographically, we next tasted Superior Yunnan Black. I immediately detected an apricot aroma that's present in some other Yunnan teas. According to Roy, this characteristic is the result of modern processing techniques that emphasize the tea's natural fruitiness. There's also a slight, pleasant spiciness. Unlike the dark red brew of the eastern black teas, the Yunnan Black's infusion is a rich golden amber. Finally, Roy threw an Indian tea into the mix, the Imperial Darjeeling Blend. 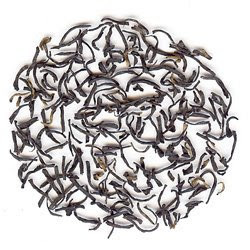 A blend of high-quality second-flush darjeelings, it yields a harmonious combination of fruit and flowers.